"At this moment, dozens of armed drones circle miles above insurgents, watching everything in real time, with resolution sharp enough to read a license plate"
"More than a third of the 200 Predators delivered to date have crashed catastrophically, due to both aircraft malfunction and human error." This timely article is coinciding with the largest Unmanned Aerial Vehicle conference currently going on in DC, The AUVSI's Unmanned Systems. 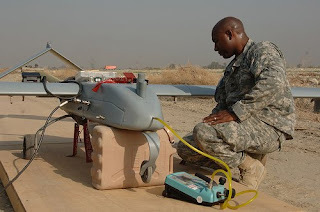 At this trade show, demonstrations of UAVs are going on, with the largest advancements being: surveillance/communication equipment, advanced propulsion, and advanced aerostructures/increased payloads. Composite materials are playing a crucial role in the bodies and wings of these vehicles, particularly autoclaved carbon components. Weight must continue to drop thus allowing these aircraft's to carry more equipment / weapons, and stay in the air longer. As this relatively young industry continues to mature, advances in composite tooling, out of autoclave production, and new composite materials will help transform the next generation UAVs and drones.